Welcome to Hilary Manufacturing. We are based in Hucknall, Nottingham and have been in the clothing manufacturing industry for over 30 years. 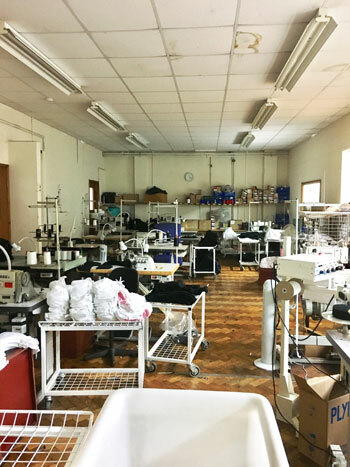 The company was started in 1983 as a family clothing business and has since grown into a leading supplier to many companies based here in the UK and around the world. With our team of experienced designers, machinists and operators we can offer you a wealth of knowledge and design within the Manufacturing Industry. Hilary Manufacturing are one of the leading manufacturer's of Medical Underwear for Men, Women and Children. We are an approved supplier for the NHS in the UK and have been for over 10 years. We have provided underwear for the Nuclear Industry and recently we have become an approved supplier to the Ministry of Defence supplying Vests/Crew T-Shirts that all Air personnel within the MOD will be wearing. We have helped many businesses over the years getting their designs to market using our dedicated teams we have the ability to get your manufacturing needs met to a high standard. In 2016 we became ISO 9001: 2015 accredited to ensure we maintain the high standards we and our customers expect of us. We are able to source the best materials from the UK and abroad but if you have your own materials you would like us to work with then that is not a problem either. Being based in the UK we can offer shorter lead times on your manufactured goods than our European/Global counterparts. Please call us now on 0115 9681188 and speak to one of our friendly team memeber's who will be happy to help you anytime. Hilary Manufacturing - Your Idea's Matter To Us! If you have any questions or would like a quotation, please contact us on +44 (0)115 968 1188 or by filling out the form below.